Private Morley was born in Westwood but later lived at Sherwood, Nottingham – probably in the Sherwood Barracks. We believe that his parents were Joseph and Mary Morley living at Westwood (shown on the 1891 census, when Joseph was 11 years old). He had sisters named Miriam and Emma. He also had a brother, Sgt George Morley, who served during the Boer War in The Imperial Yeomanry. Joseph was also a veteran of the Boer War. 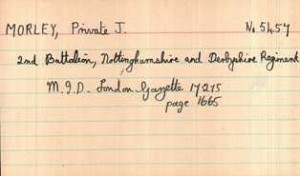 At the age of sixteen, he enlisted in Nottingham on 28th September 1896. He was wounded, whilst serving with ‘H’ Company on 29th May 1901 at Vlakfontein, South Africa. He was invalided and transferred to ‘details’ in Aldershot, with effect from 1st November 1901. 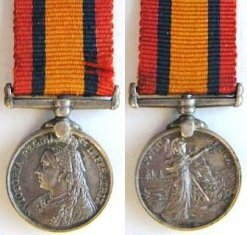 This earned him the ‘Queen’s South Africa Medal with Clasps’ in 1901. 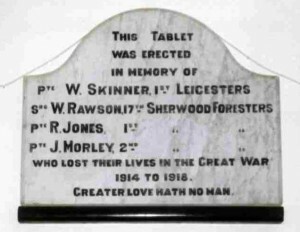 As a regular soldier in the 1st Bn (Derbyshire Regt) Sherwood Foresters at the outset of World War One he was an “Old Contemptible” and an early casualty, killed in action during the German attack on the trenches at Troyon, France on Sunday 20th September 1914, aged 33 years. He was posthumously Mentioned In Despatches on the 14th January 1915, and reported in the London Gazette 17 February 1915 (pg.1665) and he was also posthumously awarded the Russian Medal of St George 3rd Class, which was gazetted on 25th August 1915. This medal was given as a gesture to boost morale between the Allied Nations. He was also awarded the 1914 (“Mons”) Star (and Clasp & Roses) as well as the British War and Victory Medals. In October 1915, Joseph’s personal effects of £15 9s 2d were divided between Herbert Storer and Joseph’s two nieces Emma Allen (nee Towell) and Cordelia Towell, daughters of his eldest sister Mary. His nieces also received a half share of his war gratuity of £5. 9862 Sgt Percy Smith, of Jacksdale, 2nd Bn. 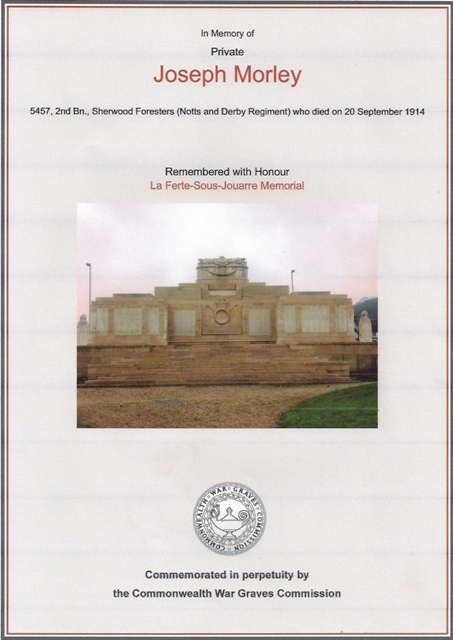 Sherwood Foresters was also killed during the attack at Troyon on the same day but is buried at Sissonne British Cemetery, Aisne, France. 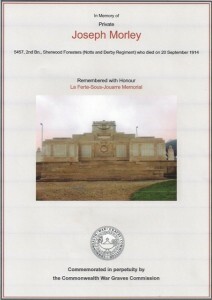 Private Morley is commemorated at La Ferte sous Jouarre Memorial, Seine et Marne – no known grave. This memorial commemorates the 3,739 officers and men of The British Expeditionary Force who fell at the battles of Mons, Le Cateau, the Marne and the Aisne between the end of August and early October 1914 and have no known grave. Please see Sgt (Charles) Percy Smith’s page on this website for two eye witness accounts of the attack at Troyon.